The Centers for Disease Control and Prevention are investigating a Salmonella Stanley outbreak linked to raw cashew cheese produced by The Cultured Kitchen of West Sacramento, California. Cashew cheese is a non-dairy product made from raw cashews. The product has been recalled. A total of 14 people in 3 states have been infected with the outbreak strain of this bacteria. Most of the ill people (85%) are from California. The case count by state is as follows: California (12), Nevada (1), and Wyoming (1). Twenty-five percent of the patients have been hospitalized. There have been no deaths. This strain of Salmonella Stanley is rare and has been seen only 20 times before this outbreak. Among patients who were interviewed, illness onset dates range from November 13, 2013 to December 9, 2013. Ill persons range in age from 2 years to 77 years, with a median age of 27 years. Fifty percent of ill persons are female. Illnesses that occurred after December 12, 2013 may not yet be reported due to the time it takes between when a person gets sick and when the illness is reported. This usually takes two to three weeks. Investigations of state, local, and federal officials indicate that the cashew cheese is the likely cause of this Salmonella outbreak. 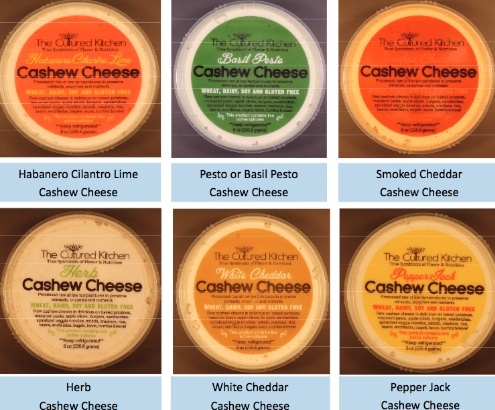 Seven of the eleven ill persons interviewed reported eating raw cashew cheese in the week before becoming ill. Of those people, six, or 86%, ate The Cultured Kitchen brand raw cashew cheese or had purchased it at a retail location that sold that brand. The symptoms of a Salmonella infection include nausea, vomiting, abdominal pain, fever, diarrhea, chills, headache, muscle pains, and blood in the stool. The symptoms usually appear six to seventy-two hours after exposure and usually lasts up to a week. The long term complications of a Salmonella infection include reactive arthritis. The recall affects all six varieties produced by The Cultured Kitchen with an expiration date of April 19, 2014 or earlier. The CDC recommends that you do not eat this product and discard any remaining product in their homes. This product has a long shelf life and it may still be in consumer’s homes. Last summer, the FDA started an investigation of the risk of Salmonella poisoning tied to raw tree nuts. Several outbreaks linked to raw tree nuts, which include pistachios, cashews, almonds, pine nuts, Brazil nuts, macadamia nuts, and walnuts, have been reported in recent years.